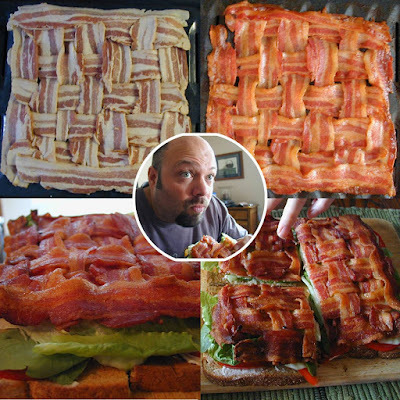 Have you heard about weaving bacon? Travis told me about it a few weeks ago. He has made it at work a few times. He seems to really like it. I have mostly seen it used for sandwiches and Martha Stewart used it as a cup for eggs. Think of all the cool things you could do with it. I want to try making a bowl and putting a salad in it. *See how Travis makes it here. no, ive never seen or heard of this before - be sure to post a picture of your salad creation in your bacon bowl! Love this!!! I had bacon this morning and thought about doing this. I didn't have enough though. What a good idea!! 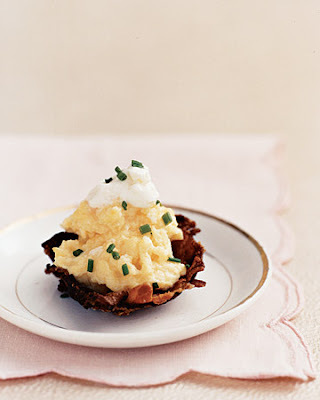 Yum, this is so clever and tantalizing! That is such a pretty, interesting pattern, but man it looks fattening!